Chewy ‘No Bake’ Oat & Chocolate Granola Bars! In a large bowl mix together the oats & chocolate crispies – set aside. Place the sugar, coconut oil & agave nectar in a small sauce pan and simmer over medium low heat, constantly stirring until the sugar is dissolved and slightly bubbly. Remove from heat and stir in the vanilla extract. Pour over the oats and stir until everything is well combined. Pour into an 8×8 or 9×9 greased pan and press everything firmly down. Compacting the mixture into the pan. Top with a drizzle of melted chocolate & place in refrigerator for 2 hours to set. Remove and cut into bars! 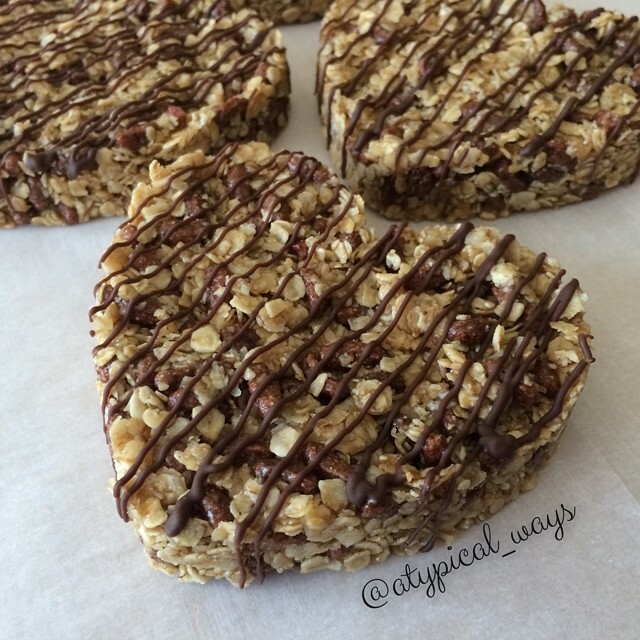 OPTIONAL STEP for heart shaped bars: Place cookie cutters of choice on a parchment lined baking sheet and press the oat mixture into each mold and then refrigerate until set. Store cut bars in the refrigerator or freezer stacked with parchment paper.